Hanotea (Hebrew: הנוטע, „the Planter”) was a citrus planting company based in Netanya and established in 1929 by long-established Jewish settlers in Palestine involved in the Benei Binyamin movement. In a deal worked out with the Reich Economics Ministry, the blocked German bank accounts of prospective immigrants would be unblocked and funds from them used by Hanotea to buy agricultural German goods; these goods, along with the immigrants, would then be shipped to Palestine, and the immigrants would be granted a house or citrus plantation by the company to the same value. Hanotea’s director, Sam Cohen, represented the company in direct negotiation with the Reich Economics Ministry beginning in March 1933. In May 1933 Hanotea applied for permission to transfer capital from Germany to Palestine. This pilot arrangement appeared to be operating successfully, and so paved the way for the later Haavara Agreement. 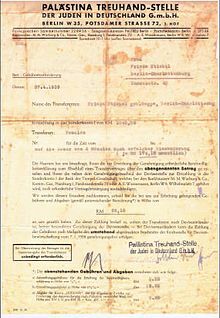 The Trust and Transfer Office „Haavara” Ltd. places at the disposal of the Banks in Palestine amounts in Reichmarks which have been put at its disposal by the Jewish immigrants from Germany. The Banks avail themselves of these amounts in Reichmarks in order to make payments on behalf of Palestinian merchants for goods imported by them from Germany. The merchants pay in the value of the goods to the Banks and the „Haavara” Ltd. pays the countervalue to the Jewish immigrants from Germany. To the same extent that local merchants will make use of this arrangement, the import of German goods will serve to withdraw Jewish capital from Germany. The Haavara (Transfer) Agreement, negotiated by Eliezer Hoofein, director of the Anglo-Palestine Bank, was agreed to by the Reich Economics Ministry in 1933, and continued, with declining German government support, until it was wound up in 1939. Under the agreement, Jews emigrating from Germany could use their assets to purchase German-manufactured goods for export, thus salvaging their personal assets during emigration. The agreement provided a substantial export market for German factories in British-ruled Palestine. Between November, 1933, and December 31, 1937, 77,800,000 Reichmarks, or $22,500,000, (values in 1938 currency) worth of goods were exported to Jewish businesses in Palestine under the program. By the time the program ended with the start of World War II, the total had risen to 105,000,000 marks (about $35,000,000, 1939 values). Emigrants with capital of £1,000, (about $5,000 in 1930s currency value) could move to Palestine in spite of severe British restrictions on Jewish immigration under an immigrant investor program similar to the modern EB-5 visa. Under the Transfer Agreement, about 39% of an emigrant’s funds were given to Jewish communal economic development projects, leaving individuals with about 43% of the funds. The Haavara Agreement was thought among some German circles to be a possible way solve the „Jewish problem.” The head of the Middle Eastern division of the foreign ministry, the anti-NSDAP politician Werner Otto von Hentig, supported the policy of settling Jews in Palestine. Hentig believed that if the Jewish population was concentrated in a single foreign entity, then foreign diplomatic policy and containment of the Jews would become easier. Hitler’s own support of the Haavara Agreement was unclear and varied throughout the 1930s. Initially, Hitler seemed indifferent to the economic details of the plan, but he supported it in the period from September 1937 to 1939. The agreement was controversial both within the NSDAP and in the Zionist movement. As historian Edwin Black put it, „The Transfer Agreement tore the Jewish world apart, turning leader against leader, threatening rebellion and even assassination.” Opposition came in particular from the mainstream US leadership of the World Zionist Congress, in particular Abba Hillel Silver and American Jewish Congress president Rabbi Stephen Wise. Wise and other leaders of the Anti-Nazi boycott of 1933 argued against the agreement, narrowly failing to persuade the Eighteenth Zionist Congress in August 1935 to vote against it. The right-wing Revisionist Zionists and their leader Vladimir Jabotinsky were even more vocal in their opposition. The Revisionist newspaper in Palestine, Hazit Haam published a sharp denunciation of those involved in the agreement as „betrayers”, and shortly afterwards one of the negotiators, Haim Arlosoroff was assassinated. Jump up^ Krüger, C. G (2009). The English Historical Review 124 (510). Oxford University Press: 1208–10. https://www.jstor.org/stable/40270563. Jump up^ Arab-Israeli Wars: 60 Years of Conflict, Ha Avara, ABC-CLIO, accessed May 7, 2013. ^ Jump up to:a b c Yf’aat Weiss, The Transfer Agreement and the Boycott Movement: A Jewish Dilemma on the Eve of the Holocaust, Yad Vashem Shoah Resource Center, accessed April 28, 2016. Jump up^ Francis R. Nicosia The Third Reich & the Palestine question, pp. 41-49. Jump up^ Evans 2003, pp. 293, 302. Jump up^ Shirer 1960, pp. 183–184. Jump up^ McNab 2009, p. 14. Jump up^ Evans 2005, p. 14. ^ Jump up to:a b Francis R. Nicosia: The third Reich & the Palestine question, p. 39 ff. ^ Jump up to:a b „Haavara Pact Extended for Only 3 Months; Seen Losing Reich’s Support”. JTA. 8 March 1938. Retrieved 1 May 2016. ^ Jump up to:a b c „Haavara Winds Up Reich-palestine Transfer Operations; Handled $35,000,000 in 6 Years”. Jewish Telegraphic Agency. 8 September 1939. Retrieved 1 May 2016. Jump up^ „Reich Migrants to Palestine Get Back 42% of Funds in Cash”. JTA. 25 May 1936. Retrieved 2 May 2016. Jump up^ Francis R. Nicosia The Third Reich & the Palestine question, pp. 132–133. Jump up^ Francis R. Nicosia: The Third Reich & the Palestine question, pp. 140, 142. R. Melka: „Nazi Germany and the Palestine Question”, Middle Eastern Studies. Vol. 5 No. 3 (Oct., 1969). pp 221–233. Hava Eshkoli-Wagman: „Yishuv Zionism: Its Attitude to Nazism and the Third Reich Reconsidered”, Modern Judaism. Vol. 19 No. 1 (Feb., 1999). pp 21–40. Klaus Poleken: „The Secret Contacts: Zionism and Nazi Germany 1933–1941”. Journal of Palestine Studies. Vol. 5 No. 3/4 (Spring–Summer 1976). pp 54–82. The Transfer Agreement is Edwin Black’s compelling, award-winning story of a negotiated arrangement in 1933 between Zionist organizations and the Nazis to transfer some 50,000 Jews, and $100 million of their assets, to Jewish Palestine in exchange for stopping the worldwide Jewish-led boycott threatening to topple the Hitler regime in its first year. 25th Anniversary Edition. A MUST READ IN AN ATTEMTP TO BEGIN TO TRY TO UNDERSTAND WEIMAR GERMANY, MUSLEM BROTHERHOOD 1924, NAZI GERMANY, PALESTINE,POST WW II, ISRAEL 1947, SUEZ, 1956, 1968, 1973, BLACK SEPTEMBER, ALFATAH, ALKIADA, 1991, GULF 1, PRE 911, POST 911, GULF WAR II, ARAB SPRING, ISIS, DISMEMBERMENT OF SYRI, IRAQ 2014-2015 G. LA TOURNERIE, WEXFORD SYSTEMS, LLC. The Transfer Agreement by Edwin Black tells the full account of how the Zionists worked with Hitler as middlemen to sell German exports during the worldwide, very effective, boycott against Germany in 1933 and later, that Jewish and non-Jewish groups around the world were supporting. They also made Israel/Palestine a major market for German goods under the agreement. I didn’t realize that there was ever such a boycott that actually brought the early Nazi regime virtually to its knees. The German people were on the verge of starvation because they needed a strong export market and couldn’t sell their products under the boycott and were also burdened by the payments they had to make under the Treaty of Versailles. Because of the financial distress the Nazi national government created an official movement to create „One Pot Meals” that cost no more than 50 pfennigs so that people could survive the winters. One cow in Palestine is worth more than all the Jews in Poland! Bio: Yitzhak Gruenbaum was a noted leader of the Zionist movement among Polish Jewry between the two world wars and of the Yishuv in Mandatory Palestine, and the first Interior Minister of Israel and candidate for President. b) The European Jews must accede to suffering and death greater in measure than the other nations, in order that the victorious allies agree to a „Jewish State” at the end of the war. 4. IS IT TRUE that this response to the Gestapo’s offer was made with the full knowledge that the alternative to this offer was the gas chamber. 6. IS IT TRUE that the same Zionist hierearchy again refused this offer (after the gas chambers had already taken a toll of millions). 9 IS IT TRUE hat the British government granted visas to 300 rabbis and their families to the Colony of Mauritius, with passage for the evacuees through Turkey. The „Jewish Agency” leaders sabotaged this plan with the observation that the plan was disloyal to Palestine, and the 300 rabbis and their families should be gassed. 10. IS IT TRUE that during the course of the negotiations mentioned above, Chaim Weizman, the first „Jewish statesman” stated: „The most valuable part of the Jewish nation is already in Palestine, and those Jews living outside Palestine are not too important”. Weizman’s cohort, Greenbaum, amplified this statement with the observation „One cow in Palestine is worth more than all the Jews in Europe”. There are additional similar questions to be asked of these atheist degenerates known as „Jewish statesmen”, but for the time being let them respond to the ten questions. These Zionist „statesmen” with their great foresight, sought to bring an end two two-thousand years of Divinely ordained Jewish subservience and political tractability. With their offensive militancy, they fanned the fires of anti-Semitism in Europe, and succeeded in forging a bond of Jew-hatred between Nazi-Germany and the surrounding countries. These are the „statesmen” who organized the irresponsible boycott against Germany in 1933. This boycott hurt Germany like a fly attacking an elephant – but it brought calamity upon the Jews of Europe. At a time when America and England were at peace with the mad-dog Hitler, the Zionist „statesmen” forsook the only plausible method of political amenability; and with their boycott incensed the leader of Germany to a frenzy. And then, after the bitterest episode in Jewish history, these Zionist „statesmen” lured the broken refugees in the DP camps to remain in hunger and deprivation, and to refuse relocation to any place but Palestine; only for the purpose of building their State. The Zionist „statesmen” have incited and continue to incite an embittered Jewish youth to futile wars against world powers like England, and against masses of hundreds of millions of Arabs. AND THESE SAME ZIONIST „STATESMEN” HEEDLESSLY PUSH THE WORLD TO THE BRINK OF ANOTHER TOTAL WAR – REVOLVING ENTIRELY AROUND THE HOLY LAND. What may befall the Jewish inhabitants of Palestine, of the Arab crescent, Europe, or the USA; is of no concern to these Zionist leaders. The rising anti-Semitism in the Western World is the product of their „statesmanship”. Under the guise of „love of Israel”, the Zionist „statesmen” seduced many Jews to replace devotion to the Torah and its Sages with devotion to the scoundrel who founded Zionism. It is of no little significance that Herzl originally sought conversion of the Jews as a solution to the problems of the Diaspora. When he realized that this was not acceptable to the Jewish masses, he contrived Zionism as a satisfactory alternative! A look into history reveals that this very same type of „statesmen” opposed the call of Jeremiah the prophet to yield to the minions of Nebuchadnezzar at the destruction of the first Temple. Five centuries later, Rabbi Yochonon Ben Zakai appealed to the people to surrender to Titus the Roman to avoid bloodshed. The „statesmen” rejected this appeal, and the second Temple was destroyed by the Romans. – And now for the past fifty years, the Zionist „statesmen” rebuff the leadership of our Sages; and continue in their policy of fomenting anti-Semitism. When will they stop?? Must every Jew in America also suffer?? – Even the Nazi monsters had more sense, and gave up their war before all Germany was destroyed. The Zionist „statesmen” ridicule the sacred oath which the Creator placed upon the Jews in the Diaspora. Our Torah, in Tractate Kesuvos, folio 111, specifies that the Creator, blessed be He, enswore the Jews not to occupy the Holy Land by force, even if it appears that they have the force to do so; and not rebel against the Nations. And the Creator warned that if His oath be desecrated, Jewish flesh would be „open property”, like the animals in the forest!! These are words of our Torah; and these concepts have been cited in Maimonides’ „Igeres Teimon”, „Be’er HaGola”, „Ahavas Yehonosson”, and in „Toras Moshe” of the Chasam Sofer. IT IS COMMON KNOWLEDGE THAT ALL THE SAGES AND SAINTS IN EUROPE AT THE TIME OF HITLER’S RISE DECLARED THAT HE WAS A MESSENGER OF DIVINE WRATH, SENT TO CHASTEN THE JEWS BECAUSE OF THE BITTER APOSTASY OF ZIONISM AGAINST THE BELIEF IN THE EVENTUAL MESSIANIC REDEMPTION. Yidden – merciful sons of merciful fathers – how much longer must holy Jewish blood continue to be shed?? 1.The Jewish people must reject, outright, a „Jewish State”. 2.The Jewish people should accept the US compromise. 3.We must depose the atheist-Zionist „statesmen” from their role as Jewish leaders, and return to the faithful leadership of our sages. 4.We beseech the Nations to open all doors to immigration – not only the doors of Palestine. 5.Peaceful, non-Zionist religious personalities in Palestine, (particularly from the native population) and their counterparts in the Diaspora, should engage in responsible, face-to face negotiations on behalf of the Jewish people, with the British and the Arabs; with an aim of amicable settlement of the Palestine issue. Every Jew is obliged to pray to the Blessed creator, for in Him lies all our strength. Let us bear in mind that our prayers be forthright. One should not entreat the Creator to provide a banquet on Yom Kippur, and one can not perform a ritual ablution with a dead bug in his hand. Similarly, we should avoid the untenable position of the robber who prays for Divine help in carrying out his crime. We should pray that Zionism and its fruits vanish from the Earth, and that we be redeemed by the Messiah with dispatch. A prisoner is released only when he has served his time, or if he is pardoned by the President for good behavior. If he attempts escape and is apprehended, his term is lengthened, besides the beating he receives when he is caught. Faithful Jews – for over three and one-half thousand years, in all parts of the world, through all trials, our grandfathers and grandmothers marched through seas of blood and tears in order to keep the Faith of the Torah unswervingly. If we have compassion for ourselves, for our women and children, and for the Jewish people, we will maintain our golden legacy today. We have been sentenced to exile by the King of Kings because of our sins. The eternal blessed be He, has decreed that we accept the exile with humble gratitude until the time comes, or until we merit His pardon through repentance if we seek to end the exile with force, G-d will catch us, as our sages have forewarned, and our sentence becomes longer and more difficult. Many times in the past have segments of our people been defrauded by false messiahs – but none of the false messiahs has been as fallacious and delusory as the lie of Zionism. With our historical experience as our guide, no retribution has been or will be greater than the retribution for giving credence to Zionism. If we wish our exile-sentence commuted, we must appeal through repentance; and through total physical and spiritual observance of the Sabbath, laws of family purity, and study of Torah. How can we plead to the Almighty for mercy while we tolerate these vile, „wicked” leaders as spokesmen! Beloved brothers – let us cleanse our ranks and cleanse our midst; let us entreat the Almighty through prayer, repentance, and fulfillment of mitzvos that He alone redeem us, His people, immediately. We implore and beseech our Jewish brethren to realize that the Zionists are not the saviors of the Jewish People and guarantors of their safety, but rather the instigators and original cause of Jewish suffering in the Holy Land and worldwide. The idea that Zionism and the State of „Israel is the protector of Jews is probably the greatest hoax ever perpetrated on the Jewish People. Indeed, where else since 1945 have Jews been in such physical danger as in the Zionist state?! Jews are enjoined by their religious laws to be loyal to the country of which they are citizens. ever since the destruction of the holy Temple in Jerusalem and the exile of the Jewish People some two thousand years ago, we have been enjoined to be scrupulously loyal to the countries we reside in, One of the great biblical prophets, Jeremiah, in chapter 29 of his book proclaimed G-d’s message to all the exiled; verse seven reads, „Seek out the welfare of the city to which I have exiled you and pray for it to the Almighty, for through its welfare will you have welfare.” This has been a cornerstone of Jewish morality throughout our history to this very day. Torah-true Jews wish to live in peace and harmony with their neighbors in every country among the community of nations, including in historic Palestine. They deplore acts and policies of violence carried out by those who, misusing the name of Israel our forefather, have substituted the ideal of chauvinist nationalism for the eternal values of the Torah, the eternal divinely bestowed inheritance of the Jewish people. It has been the age-old intention of Zionism to intentionally stir up anti-Semitism anywhere possible, and even more commonly, to take advantage of any Jewish suffering anywhere in order to enhance its cause Indeed, hatred of Jews and Jewish suffering is the oxygen of the Zionist movement, and from the very beginning has been to deliberately incite hatred of the Jew and then, in feigned horror, use it to justify the existence of the Zionist state this is, of course, Machiavellianism raised to the highest degree. Thus, the Zionists thrive on hatred and suffering of Jews, and seek to benefit thereby through keeping Jews in perpetual fear, causing them to ignore the true nature of Zionism, and instead to consider the Zionist state is their salvation. Although Zionists and others dispute it, the undeniable fact is that revolutionary secular and apostate elements in the Jewish community in Europe contributed greatly to hostility towards Jews after World War I. This aroused hatred of Jews in general among many non-Jews. While a prisoner in 1924 in the fortress of Lansberg on the River Lech, Hitler wrote his Mein Kampf. We he became Chancellor of Germany in 1933, he was assisted by Goebbels, Roseberg and Streicher. From them came the declarations, „The Jews of Germany caused the defeat of Germany in the 1914-1918 war; the Jews of Germany were responsible for the terrible conditions in Germany that followed the war; the Jews of Germany are foreigners and they wish to remain foreigners; they have no loyalty to the country of their birth; they are not human; they are filthy dogs; they have no right to intrude into Germany,s affairs; there are too many Jews in Germany. Additional words from the vivid imagination of this dreamer, from p. 68 of Part I of his Diary. So anti-Semitism, which is a deeply imbedded force in the subconscious mind of the masses, will not harm the Jews. I actually find it to be advantageous to building the Jewish character, education by the masses that will lead to assimilation. This education can only happen through suffering, and the Jews will adapt. Hateful views of Jews as being subhuman did not have to be invented by Nazi theorists such as Hitler, Goebbels, Rosenberg and Streicher. This ideology was simply adapted from statements of political Zionists such as those found in the writings of the Zionist Yehezkel Kaufman in 1933. In 1920 there were statements hostile to Jews expressed at Heidelberg University. These statements, arguing that Jews of Germany had caused the turmoil that followed the war; that the Jews of Germany had nothing in common with Germans, and that Germans had the right to prevent the Jews of Germany from intruding into the affairs of their volk were not made by Adolf Hitler in Mein Kampf, but by Nahum Goldmann, who went in to become the President of the World Zionist Organization and head of the World Jewish Congress, and, indisputably, the most influential political Zionist in the world, second only to the Prime Minister of the State of Israel. „We Jews are aliens a foreign people in your midst and we wish to stay that way. A Jew can never be a loyal German; whoever calls the foreign land his Fatherland is a traitor to the Jewish people”. Who spoke these vile words? It was Jacob Klatzkin, the second of two political Zionist ideologists in Germany at the time, where the Jews of Germany were enjoying full political and civil rights. It was he who had advocated undermining Jewish communities as the one certain way of acquiring a state. „They had no qualms concerning tearing down the existing Jewish communities. Who spoke in a public address at a political Zionist meeting in Berlin and declared that „Germany has too many Jews? Was it Hitler or Goebbels? No, it was Chaim Weizman, later to become the first President of the State of Israel. This address was published in 1920, and, thus, four years before Hitler had even written Mein Kampf. How many Zionist Jews know of this vicious treachery uttered by these senior political Zionist leaders, these apostates from the Jewish People? At the Nuremberg Trials of Major War Criminals, Nazi propagandist, Julius Streicher testified: „I did no more than echo what the leading Zionists had been saying, it is clear that he had told the truth. In addition to Hitler, Rosenberg, Goebbels and Streicher, many other Nazi leaders used statements from Zionists to validate their charges against the Jews of Germany. Such are the efforts of Zionist leaders to this very day to maintain a high degree of anti-semitism in order to enable them, in feigned horror, to then point to anti-semitism to support their idolatrous and anti-Jewish cause. In 1963, Moshe Sharett, then Chairman of the Jewish Agency, told the 38th Annual Congress of the Scandinavian Youth Federation that the freedom enjoyed by the majority of Jews imperiled Zionism, and at the 26th World Zionist Congress, the delegates were told that the Jew is endangered by the easing of anti-Semitism in the United States „We are endangered by freedom he declared. As we stated earlier, Zionism thrives on anti-Semitism. Ben Gurion declared, „not always and not everywhere do I opposed anti-Semitism. Zionists regularly pull out their handy „anti-Semite race card against anyone, Jew or non-Jew, who dares to speak out against the wickedness of Zionism. To those who assume that Zionists have been on the side of freedom and equality, these words seem strange. However, to those who understand the root of Zionism, which is the transformation and eradication of the concept of the traditional Jew and Judaism, these statements are not strange at all. They are to be expected. The Zionists agreed with Nazism in general, even prior to the advent of Nazism. They believed that Jews could not, and should not, live in harmony in any other society in the world, and that should be removed from those societies for the benefit of those societies. They believed that the new Jewish existence in its own State would remake the image of Jews as „useless and „parasites. These ideas existed long before Adolf Hitler! It is ironic that the Zionists proclaim their State as the safe haven for the Jewish People, when since World War II no place on earth has been as dangerous for Jews, both spiritually and physically, as the Zionist state. The Zionists worked relentlessly to create fear among Jews in the Arab countries after the Zionist state was established. Their tactic work most successfully in Yemen, Morocco, Iraq, Algeria, Libya, Tunisia. The writings of Mr. Naim Giladi document in detail what the Zionists did in Baghdad in 1950 to provoke the departure of the Jews to the Zionist state. The Zionists do not care what effect their policies have on the Jewish communities of any country. When they accuse European nations of every sin under the sun, do the Zionists care that this will produce hostility towards Jews? No! Not a bit. On the contrary, as we have discussed, they thrive on such circumstances, clinging to the vain hope that these Jewish communities will rush for the „salvation of the „safe haven of the Zionist Paradise where Jews are in constant danger as the Zionist regime undertakes every form of cruel provocation against non-Jews. In more recent times the Zionists have sought every opportunity to encourage Jews to leave their home countries. Anytime there is even the smallest event of hostility toward Jews on the heels of Zionist policy, or if there are signs of economic distress and dislocation, the Zionists magnify it a thousand times, seek to ruthlessly humiliate the nations involved, and agitate for Jews to go to the Zionist state, the so-called „natural home of the Jewish People. This has been the case in countries such as France, Argentina, Uruguay, the former Soviet Union and Egypt. The promises of the Torah are always to be realized. This verse from the Torah demonstrates that those who are his enemies will pay a price when The kingdom of G-D will prevail. Deuteronomy 32:43: Praise his People, O Nations: For he will avenge the blood of his servants. He will render vengeance against his adversaries and make expiation for his land and his People. The Jews of Batna, Aleria: A Study of Identity and Colonialism by Elizabeth Friedman. The Jewish Communities of Morocco and the AIU by M. Laskier, State University, Albany, N.Y. The Impact of Western European Education on the Jewish Millet of Baghdad by Maurice Sawdayee. Outcaste Jewish Life in Southern Iran by Laurence D. Loeb. Gordon and Breach. The Last Arab Jews. The Communities of Jerba, Tunisia by Abraham Udovitch and Lucette Valensi. Harwood Academic Publishers. This entry was posted in Dzieje, Nauka o człowieku, Stara nauka, Tradycje i kultury, Zakazana Wiedza, Ściemy na masę, Życzenia pobożne and tagged #GermanDeathCamps, #JewishCollaborationWithNaziGermany, #JewishNaziCollaborators, #PolishHolocaust, #PolishHolokaust, 13 Leszno, 13 Leszno Street in Warsaw, 25 August 1933, Abraham Gancwajch, Adam Czerniakow, Adolf Hitler, agreement between Nazi Germany and Zionist German Jews, and the Law: A Quest for Justice in a Post-Holocaust World, Anglo-Palestine Bank, Ans van Dijk, ANTI-SEMITISM BY POLITICAL ZIONISM, Auschwitz, ‎ Rachel Neiman, Bernard Goldstein, Birkenau, British Mandatory Palestine, Central Office of the Jewish Council of Elders in East Upper Silesia, Chaim Rumkowski, Chełmno extermination camp, Collaboration with Occupying Forces and Genocide in the Second Republic 1918-1947, David Gutter, David M. Crowe, denial, double ethics, double morality, double standards, Edwin Black, Eichmann in Jerusalem, Eliezer Hoofein, Elsa Trank, Else Tarnek, Enemies Within Our Camp- The Trial of a Kapo, Five Years in the Warsaw Ghetto: The Stars Bear Witness, Genocide, German, German Gestapo, German invasion of Poland in September 1939, German Jewish, German National People's Party, German occupied territories, ghettos in Nazi-occupied Europe, Give Me Your Children, Gomberg map, Greatest Hoax Ever Perpetrated On The Jewish People, Gross-Rosen concentration camp, Gross-Rosen concentration camp in Germany, Group 13, Group Thirteen, Guttman Shmuel Landau, Haaretz, Haavara Agreement, Hannah Arendt, Hanotea, Hashomer Hatzair, HItler, Holocaust, Holocaust Industry, Holocaust scholar, http://jewishcrimes.info, http://www.jewsnotzionists.org, https://www.haaretz.com, Hungary, Ignacy Diamond, II World War, Itamar Levin, Jacob Gens, Jakub Lejkin, Józef Andrzej Szeryński, Jewish Agency, Jewish Aid and Rescue Committee in Budapest, Jewish collaboration with Nazis Germany, Jewish collaboration with Nazis Germany during II World War, Jewish Community of Vienna, Jewish council, Jewish ethics, Jewish Gestapo, Jewish Ghetto Police, Jewish ghettos in German-occupied Poland, Jewish Holocaust Amnesia, Jewish honor, Jewish kapos, Jewish Nazi collaborators, Jewish self-agency, Jewish Sonderkommando, Jews Accusing Jews, Jews Against Zionism, Jews were put on trial in Israel for aiding the Nazis, Josef Löwenherz, Josef Szynkman, Judenrat, Kapo on Allenby, kapos, Katarzyna Person, Kurt Becher, Leon Rosenblatt, Litzmannstadt, Litzmannstadt Ghetto, Man’s Search for Meaning, Marcel Zellinger, Mordechai Chaim Rumkowski, Mordechai Goldstein, Moshe Merin, Moshe Pochich, Nazi and Nazi Collaborators (Punishment) Law, Nazi and Nazi Collaborators Law, Nazi collaborator in the Warsaw Ghetto, Nazi concentration camps for Poles in Silesia, Nazi German administration, Nazi-imposed Jewish councils, Nazi-imposed Judenrat, Norman G. Finkelstein, NSDAP, Ofer Aderet, One cow in Palestine is worth more than all the Jews in Europe, One cow in Palestine is worth more than all the Jews in Poland, Oskar Schindler: The Untold Account of His Life Wartime Activities and the True Story Behind the List, Ostrovitz ghetto, Palästina Treuhandstelle, Poland, Poland’s Holocaust: Ethnic Strife, Poles, Polish citizens, Primo Levi, Rabbi Weissmandel, Restoring ‘Jewish honor’, Revisionist Zionist, Reya Hanes, Rudolf Kastner, Schindler’s Ark, Schindler’s List, Shoah, smuggling furs out of the Warsaw Ghetto, Sonderkommando, Stella Kubler, Symche Spira, Szlojme Hercberg, Szymon Spitz, Tadeusz Piotrowski, Talmudic ethics, The Drowned and the Saved, The Holocaust Industry: Reflections on the Exploitation of Jewish Suffering, The Nazi collaborator who served ice cream in Tel Aviv, The Transfer Agreement, The Trust and Transfer Office "Haavara" Ltd, Thomas Keneally, Tzvi Yaakovson, Viktor Frankl, Vladimir Jabotinsky, Walls Around: The Plunder of Warsaw Jewry during World War II and Its Aftermath, Warsaw Ghetto, Wehrmacht, Weronika Grynberg, Wiera Gran Vera, Wladyslaw Szpilman, World War II, World Zionist Congress, Yaakov Honigman, Yechezkel Ingster, Yehezkel Ingster, Yitzchak Gruenbaum, Ze'ev Jabotinsky, Zentrale der Jüdische Ältestenräte Ostoberschlesien, Zionism, Zionism And Anti-Semitism, Zionist Federation of Germany by SKRiBHa. Bookmark the permalink. Niemcy były najlepiej przygotowane do wojny (militarnie), lecz program modernizacji i reformy rosyjskiej armii i ogólnie boom demograficzny i gospodarczy państwa carów tak przerażał niemieckich generałów i polityków że już przed zamachem w Sarajewie uważali że „teraz albo nigdy” – bo czas grał na ich niekorzyść. Zrozumcie, to jest wojna! Najskuteczniejszą metodą pokonania wroga, zawsze było odcięcie jego dostaw. Zakręćcie kurek z kasą. Rysunek C. Krysztopy na bilbordy i wznowienie ekshumacji w Jedwabnem! 100 milionów na remont cmentarza z naszych podatków już przyznane, teraz proponuję dorzucić 0,5 mld. na projekt upamiętnienia marca 68, zgodnie z wizją zainteresowanych w szkalowaniu Polski. Brawo, brawo i jeszcze raz brawo. Tak nam starsi bracia nieustannie odpłacają za uprzejmość i dobre serce. A tak na marginesie, Polacy to chyba jedyna nacja, która od lat, z upodobaniem i jakąś masochistyczną satysfakcją hoduje i hołubi wrogów we własnym domu. No bo jak nazwać budowę tego muzeum za ogromne pieniądze należące do Polskiego podatnika i oddanie go w zarządzanie żydom, którzy decydują o jego narracji? Z czyich pieniędzy jest utrzymywane muzeum Polin i kto jest jego właścicielem i komu ten właściciel podlega? dlaczego antypolonizm nie jest karany? dlaczego można nt. narodu polskiego kłamać, obrażać? natomiast gdy my mówimy prawdę to od razu jest akt oskarżenia o mowę nienawiści itp. Byłem przeciwny powstaniu muzeum Polin zwłaszcza z dotacjami budżetowymi i samorządowymi, oraz kadrami żydowskimi czytaj grossowymi. To była od początku antypolska koncepcja i ślepy tego nie widział. Proszę używać pełnej nazwy Muzeum Historii Żydów w Polsce, tak wolę a ponieważ za to płacę to nalegam. TYLKO U NAS. Opowiedzmy swoją historię, zanim zrobią to za nas. Czy Polin już teraz szykuje kampanię zniekształcającą obraz wydarzeń z Marca ’68? Do dziennikarzy portalu wPolityce.pl docierają nieoficjalne informacje mówiące o tym, że Muzeum Historii Żydów w Polsce Polin przygotowuje spot sugerujący problem związany ze zjawiskiem antysemityzmu w Polsce. W podtekście – taki sam jak ten sprzed 50 lat i wydarzeń Marca‘68. Tematem ma zajmować się jedna z największych na świecie agencji PR. Na podstawie ostatniej debaty w owym muzeum już teraz można stwierdzić, że narracja instytucji jest, delikatnie rzecz ujmując, nieprzychylna obecnemu rządowi. Porównywanie wydarzeń z marca 1968 r. do obecnych jest jednak, mówiąc już dosadniej, skandaliczne. Czyżby muzeum chciało stworzyć obraz antysemickiej Polski? Według naszego informatora, w przeddzień 50 rocznicy wydarzeń z 8 marca 1968 r. chce przygotować spot całkowicie wypaczający obraz tamtych dni. Porównujący haniebną nagonkę polityczną komunistycznych władz w Polsce do postawy całego narodu. A także postawy rządu PiS do postawy włodarzy PRL. Ma to być film sugerujący antysemityzm w Polsce. Taki sam jak 50 lat temu. Tematem ma zajmować się jedna z największych na świecie agencji PR. Bohaterką filmu ma być blondwłosa dziewczynka o niebieskich oczach głosząca antysemickie hasła. W domyśle – Polka antysemitka. Czyżby muzeum rzeczywiście chciało w ten sposób dolać oliwy do ognia i tak gorejącego już konfliktu na linii Polska-Izrael? Z przedstawicielami instytucji próbowaliśmy się skontaktować, ale – jak do tej pory – bezskutecznie. Zanim rozpoczną się oficjalne obchody upamiętniające tamte wydarzenia, i zanim kolejne działa zostaną wytoczone przeciw Polsce, należałoby wziąć sprawy w swoje ręce. Pokazać światu historię taką, jaką była. W istocie, w latach 1968-1969 z Polski wyemigrowało ponad 15 tys. Żydów bądź osób pochodzenia żydowskiego. Wśród nich było m.in. ok. 500 pracowników naukowych, ok. 1000 studentów, a także dziennikarze, filmowcy, pisarze i aktorzy. „Komuniści próbowali zmobilizować w Polsce w marcu 1968 r. najciemniejsze siły drzemiące w każdym społeczeństwie – szowinizm, rasizm i ksenofobię – by rozegrać swoje porachunki oraz przesłonić istotne przyczyny permanentnego kryzysu społecznego w PRL, oduczyć Polaków racjonalnego myślenia i uczynić wspólnikami w walce z urojonym wrogiem”. Jeśli takiej kampanii nie przygotował rząd, działać musimy my. Tak jak tysiące internautów już tagujących i przekazujących dalej prawdę o polskiej historii w świat. Jak internauci tworzący nowe filmy, po polsku i po angielsku. Jak młodzi tłumaczący hasła związane z polską historią, z Polakami ratującymi Żydów na jeszcze inne języki. Jak każdy z nas, który spisuje wspomnienia swoich przodków sprzed lat. Dziś widzimy wyraźnie, że to, jaką historię usłyszą nasze dzieci, zależy od naszego pokolenia. Bo ostatnich świadków może za chwilę zabraknąć. Wybudujmy im jeszcze jedno muzeum za pieniądze polskiego podatnika ,a oni w podziękowaniu nasiusiają nam na głowę . Uważam że Żydzi to perfidna i niewdzięczna nacja . No wlasnie. Zydowskie kiepele jeszcze raz daje znac o sobie. Muzeum wybudowane za pieniadze polskiego podatnika bedzie znowu informowalo swiat o polskim antysemityzmie. Ale to Polska czyli polscy podatnicy finansują Muzeum Polin z jego antypolską działalnoscią, finansowac tez będą opluwajacyc nas spot. Nie chce mi się pisać, więc pożyczam: „Z czyich pieniędzy jest wybudowane i utrzymywane to muzeum, kto jest jego właścicielem, komu ten właściciel podlega?” Czyj interes broni ta instytucja? Trzeba pisać jak było w M’68? Ale gdzie? W listach do znajomych? A może w którymś z pism prawicowych? Tu jednak zero szans. Nie jest tajemnicą, że nikogo poza swym grajdołkiem nie dopuszczą do druku. Cofnąć finansowanie! PiS za to płaci! Najwyzszy czas wymienic w tym muzeum dyrekcje.Co tam robia ludzie ktorzy przypisuja Polakom antysemityzm na sile?to przeciez w Polsce Zydzi czuja sie najbezpieczniej ze wszystkich panstw Europy. A czy zajmiecie sie SWASTYKAMI malowanymi na drzwiach Ambasady RP w Izraelu? A rozliczycie ZYDOW amerykanskich za brak pomocy dla zydow europejskich? Paskudne kłamstwa ludzi pokroju Grossa, Grabowskiego, Kosińskiego et consortes to czysty ANTYPOLONIZM. Obnażanie tych kłamstw to nie ANTYSEMITYZM!!! Dlaczego Polin chce walczyć z czymś czego nie ma?? Może w końcu konkretnie przykłady takich wypowiedzi i ile ich jest. ADL w USA też obserwuje setki antysemickich zachowań, najwiecej gdy jakiś dyrektor nie chce dać wolnego w dzień żydowskiego święta. Muzeum Historii Żydów Polskich POLIN odpowiada na informacje wPolityce.pl. Do dziennikarzy portalu dotarły nieoficjalne informacje mówiące o tym, że Muzeum Historii Żydów w Polsce Polin przygotowuje spot sugerujący problem związany ze zjawiskiem antysemityzmu w Polsce. W podtekście – taki sam jak ten sprzed 50 lat i wydarzeń Marca‘68. Tematem ma zajmować się jedna z największych na świecie agencji PR. CZYTAJ WIĘCEJ: TYLKO U NAS. Opowiedzmy swoją historię, zanim zrobią to za nas. Czy Polin już teraz szykuje kampanię zniekształcającą obraz wydarzeń z Marca ’68? Będziemy natomiast zajmować się tematyką mowy nienawiści, w tym antysemickiego hejtu. Niestety, zjawisko to narasta w wielu krajach Europy, w tym także Polsce, w szczególnie widoczny sposób w Internecie. Niektóre wypowiedzi spotykane dziś online są bardzo zbliżone do treści, które padały w PRL wiosną 1968 r. Zapewne wiele osób czyni to dziś bezwiednie, stąd potrzeba edukacji oraz wskazywania i piętnowania mowy nienawiści – aby nie doprowadzić do eskalacji tego zjawiska. drugie takie po Auschwitz !!! A ten ,,Polin,, co się wypowiada to kto to jest konkretnie? Oddać muzeum pod zarząd IPN. Kropka. Składam sprzeciw wobec finansowania jakichkolwiek żydowskich miejsc społeczno kulturalnych z podatków Polaków żadnej budowy kolejnego miejsca do propagowania antypolonizmu! A może pogadamy o komunistach przedwojennych i PKWN? Porażające jest to , że my za to wszystko płacimy i to utrzymujemy a żydzi przedstawiają tam swoją narrację jakoby to Polacy ich wymordowali – szczyt hipokryzji !!! Panie Gliński do roboty !!!!!!!!! Piękny ale i tragiczny list,jak na dłoni widać wiele źródeł kłamliwej narracji,serwowanej przez opłacanych przez nas,przewodników.Sami wyhodowaliśmy ten wrzód…. Groby zydowskie powinny utrzymywac gminy zydowskie, ktore odzskaly i odzyskuja swoj majatek od Polski! Prosze oddac naszze 100 milionow panie Glinski , to skandal! Ile pieniedzy dostaly gminy zydows? Gliński tzw.Premier z Tableta to lewak i nie powinien być ministrem,a jeżeli już jest to powinien zostać natychmiast usunięty. 100% prawdy, ale Glińskiemu nie ufam. Nie uważam, aby reprezentował on interesy Polaków. Panie premierze niezwłocznie odwołać min. Glińskiego. Jego działania szkodzom Polsce i Polakom. Upokarza nas. To dawno powinno być wyprostowane, a obecny Dyrektor Muzeum w Auschwitz dawno powinien być wymieniony!! List jest bardzo dobry, dodałbym jeszcze że w Muzeum Auschwitz marginalizuje się postać Witolda Pileckiego. Czy adresatem listu powinien być p. Gliński? List powinien być skierowany do premiera Morawieckiego, to jest sprawa wagi państwowej. Min. Gliński zobowiązał się, że odtąd będzie intensywnie promował kulturę żydowską (dlaczego nie polską? ), przekazał z ministerstwa 100 mln na żydowski cmentarz, a ostatni jego krok to powołanie do Rady muzeum Polin takich ludzi jak znany anty-Polak, były ambasador Ryszard Schnepf, Adam Daniel Rotfeld, czy też (sentymenty z Unii Wolności?) Małgorzata Niezabitowska. Taki skład gwarantuje, że będzie się umacniać jedynie słuszną wersję historii, czyli tak jak wygląda oczami Żydów. Pan Gliński jest ostatnim człowiekiem, który może zrozumieć taki list i najpewniej wyrzuci go do kosza. KAPITALNE. Ten pomysł z mieszkaniem i z racją żywnościową znakomity! Głęboko poruszają mnie te obywatelskie inicjatywy, ta szczególnie. Panie Michale wyrazy najwyższego uznania. Już dawno pisałem że dyrektor muzeum w Oświęcimu jest do odwołania tak samo jak gliński ale jaki pan taki kram!